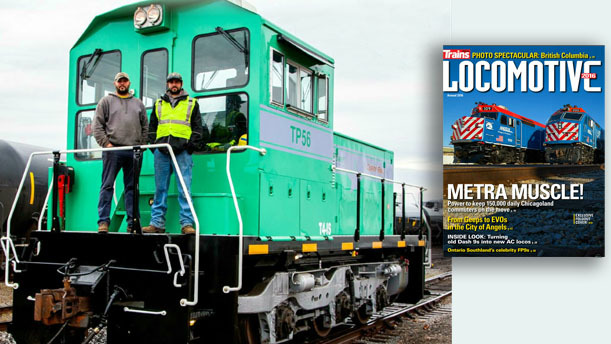 TRACTIVE POWER CORPORATION – Trains Special- Locomotive 2016 – Annual – Magazine Article Our TP56 Industrial Locomotive. Acquire one well-used SD40 ~ 2, cut it in two, add state-of-the-art technology, a new car body and cab, and bingo: two versatile, brand-new switchers that are Tier 4 compliant. That’s the short story of Tractive Power Corp’s new TP56 and TP70 industrial switchers. As Class 1 railroads continue to shed as many switching operations as possible, numerous industries have begun to perform their own switching or contract it to private operators. This, along with more stringent emission regulations, has opened a new market for small motive power. British Columbia- based Tractive Power has a unique solution: a compact ( 27 – foot , 10-inch), robust, three-axle, diesel-electric switcher constructed using a single EMO HT- C truck, three D77 traction motors, and half the frame of an EMO 50 40-2. The TP56 (56,000 pounds tractive effort) and TP70 (70,000 pounds tractive effort) models are customizable and available with U.S. Environmental Protection Agency Tier 3 ~ or Tier 4-compliant diesel engines. TPC’s prototype locomotive, a 375-hp TP56, was manufactured in 2014 using space at the West Coast Railway Museum in Squamish, British Columbia. A retired Canadian Pacific S0 40- 2 provided the frame, trucks, and traction motors for the project. Not just any 50 40-2, but No. 5805, a locomotive I had photographed in Rogers Pass, and later worked aboard while doing a stint with CP in Revelstoke, B.C. The prototype proved successful and went to work at Parrish & Heimbecker grain facility in Cloverdale, B.C. The second locomotive, a TP70, was delivered to a customer in Vancouver. Tractive Power, meanwhile, struck a manufacturing agreement with Curry Rail Services to produce TP switchers at its shop in Hollidaysburg, PA.
Based in the 100,000-square-foot Samuel- Rea car shop built by the Pennsylvania Railroad, Curry Rail Services has been a provider of freight-car services and locomotive products for more than 20 years. In recent times, Curry has expanded its offerings to include locomotive-cab fabrications for Norfolk Southern’s Admiral Cab program and locomotive frames for road slugs built by NS at its Juniata Shop in nearby Altoona. CP No. 785, a retired SD40-2 of Soo Line heritage, was selected for the first Hollidaysburg- built TP switcher, a TP56 completed in early 2016. I called on Curry in April to test drive Curry’s own TP56. The donor locomotive is stripped to a bare frame and cut into two 27-foot, 10 inch sections. The trucks are completely refurbished; a new pilot is fabricated on the end of the frame where the cut was made. The bolster is re-engineered so the truck no longer swivels, and when the truck and frame are mated, they are welded together. The engine, a 375-hp Caterpillar C9 ACERT-37 in this case, is mounted to the frame. Everything above the frame is new; including a Curry-fabricated car-body and spacious cab complete with an AAR control stand and 26 air brakes. Curry’s bright green-and-silver TP56 works the CRS facility in Hollidaysburg, spending the day digging out and spotting cars at the car shop as well as switching the hundreds of freight cars stored in the yard. Let’s see how the switcher feels and operates in tough world or freight car switching. “She’ ll never be a beauty queen;’ I thought as Travis Semanchik and Matt Aungst pulled up to the office in the little TP56, but that’s what they said about EMD’s GP7, and it set a new standard for the industry and became a best seller. Climbing aboard, I was impressed with the cab, its excellent visibility, great seats, air conditioning, and stainless steel ceiling and walls. Rugged was my next impression. The TP56 may be small, but it appears to carry on the tradition of the SD40-2 heritage by being built to last and easy to maintain. Hollidaysburg is typical of yards everywhere. Lots of switches, some rough spots, and track that is slippery in wet weather. Travis made the first few moves as we talked about the unit and then put me in the seat. The standard AAR control stand and radio were all familiar, but the screen above the brake stand, giving full views at the front of the locomotive, was a great added feature for switching. The unit rode beautifully on its six-wheel truck and visibility was exceptional. Matt was working the ground and had no trouble entraining or detraining using the well-designed steps and handrails. Most importantly, he was always visible to me, either directly or on the video screen. Switching is hard on locomotives. Constant starts stops and coupling impact soon take their toll, but the little TP56 is built to take it. Tractive effort is crucial, so with wet rail, and a cut of27 tank cars, it was time to test her mettle. Notching out, it was like the little engine that could. With no slipping, no smoke, little engine noise, and a solid feel, she soon had our cut on the move. I thought of the GP9 that I normally run slipping, roaring away, and offering a fair amount of exhaust to the atmosphere in similar circumstances. What a difference! The folks at CRS tell me they have moved over 40 cars with no difficulty. Add this to the fact the locomotive sips fuel and consumes just a half-gallon an hour at idle. The TP56 and TP70 seem perfectly positioned to fill a niche in the switching world. Size matters with switchers and in this case, small wins. Contact us today to see what differences a TP56 can make for your business.